California's current drought has been caused by the demand for water needed to cultivate cannabis, which, under state law, is illegal for recreational use. Streams are running dry, fish are dying, and it’s just the beginning, US scientists warn. “All the streams we monitored in watersheds with large scale marijuana cultivation went dry,” said California Department of Fish and Wildlife Senior Environmental Scientist Scott Bauer, who is the lead author of the study. "The only stream we monitored that didn’t go dry contained no observed marijuana cultivation." As the water system is ruined, fish and amphibians are suffering huge risks – the effects are "lethal or sub-lethal ... on state-and federally-listed salmon and steelhead trout and to cause further decline of sensitive amphibian species," the study said. The problem lies within the fact that, as growing marijuana is a covert practice in the state, it occurs on private property. So scientists have faced difficulties to estimate the ecological damage, and in their work they used Google Earth historical data and high-resolution aerial imagery, obtained by low-altitude aircraft flights in cooperation with law enforcement. "Marijuana has been cultivated in the backwoods and backyards of northern California at least since the countercultural movement of the 1960s with few documented environmental impacts," the study said. "Northwestern California has been viewed as an ideal location for marijuana cultivation because it is remote, primarily forested, and sparsely populated." A marijuana plant requires an estimated 22.7 liters of water per day, and, according to the report, the water demand in the growing season from May to September exceeds stream flow in some areas. “Both monitoring and conservation measures are necessary to address environmental impacts from marijuana cultivation. State and federal agencies will need to develop more comprehensive guidelines for essential bypass flows in order to protect rearing habitat for … aquatic organisms,” the scientists conclude. Pot farms, including greenhouses, are unregulated in the state, where recreational use of marijuana is illegal and people using it in any way can face federal prosecution. Yet, from 2009 to 2012 the number of pot plantations has nearly doubled. According to a California market research firm, the ArcView Group, the legal market for marijuana across the US grew 74 percent from $1.5 billion in 2013 to $2.7 billion in 2014, nationwide. Marijuana is legal for medical use in 23 states as well as in Washington DC. 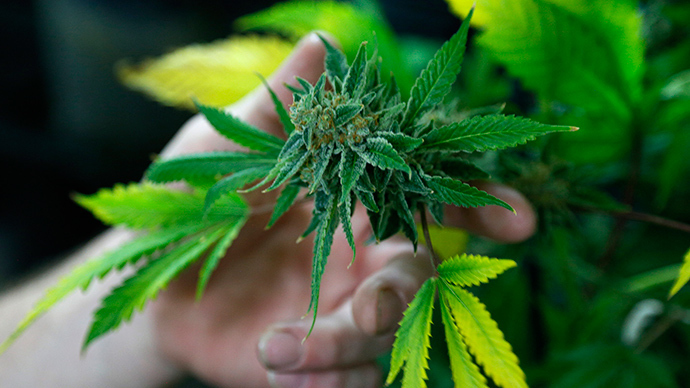 Four states - Alaska, Oregon, Colorado and Washington - allow its legal recreational use.